Day 2 of the Mercedes-Benz Marathon Race Weekend. 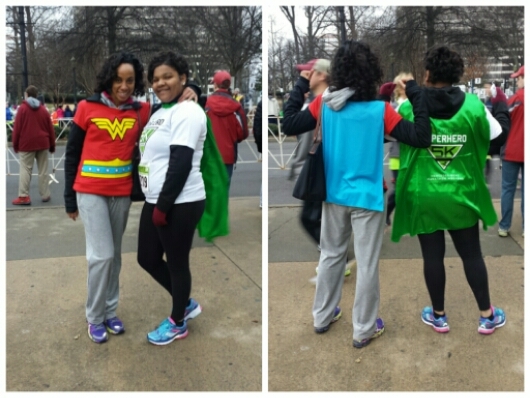 Saturday was all about Nylia running in the Regions Superhero 5K. 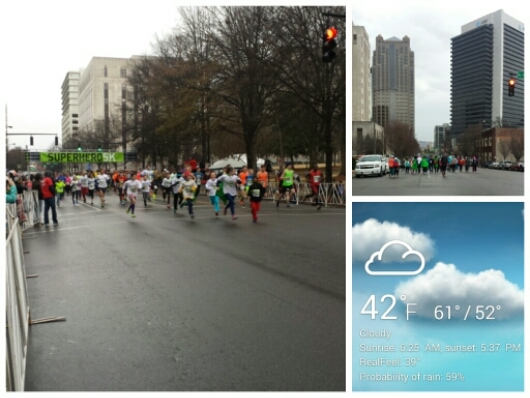 The biggest factor of the weekend was the weather. 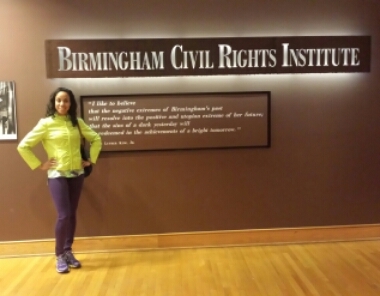 Nylia planned to run in shorts, but she changed to tights when she saw the 40° forecast with wind gusts and rain. We parked a block over from the starting line. Everyone was taking photos and hesitating to line up at the start. We met a Regions employee named Monica. 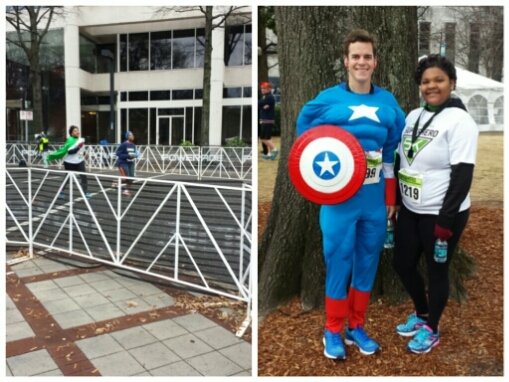 This was her third year running the Superhero 5K. She offered to run with Nylia since this was Nylia’s first solo race event. About 5 minutes before the start there was a heavy rain which lasted about 2 minutes. It went away, but the first turn onto 19th Street lead the runners into a strong head wind from what I was told. Unfortunately, they had to battle the 20 mile/hour wind gusts for almost a mile. Nylia stopped for water at the half way point. 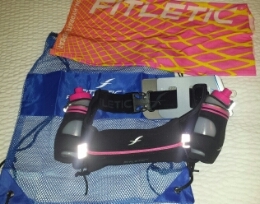 While she was running I decided to go back to the expo and buy a 16oz Fitletic Hydration belt. The vendor helped me find a belt trimmed with pink and threw in a pink and yellow neck warmer and drawstring bag. I ventured outside towards Linn Park. The rain had let up, but the wind turned everyone’s capes into aprons. I sat on a bench off 20th street and cheered on runners as they hit the last two turns towards the finish. I was looking for Monica’s pink jacket, because I knew Nylia would be close by. Sure enough I saw the jacket and stood up and started waving. Nylia forgot all about being by herself and took off sprinting. I ran down the sidewalk to get ahead of her and take more photos. I kept cheering her on and she finished strong. The race announcer called her name, city and state. She finished 12th in her age group. 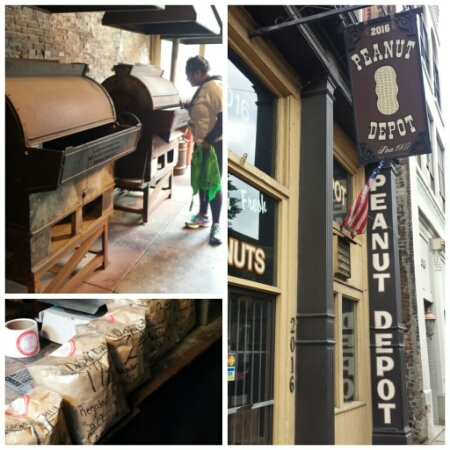 After the race we went to the Peanut Depot on Morris Ave to get 3 pounds of cajun roasted peanuts. Right around the block is an intersection at 20th Street and 1st Avenue North that is named “the heaviest corner on earth.” It was given that name because these four buildings represented the tallest buildings in the South during the early 1900s. 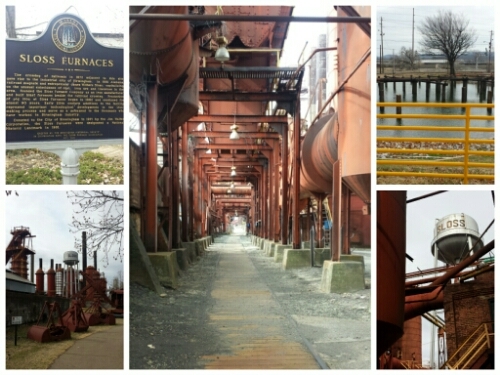 We were only 2 miles away from another tourist attraction called Sloss Furnaces. There were a lot of artists sketching sections of the former industrial work site. 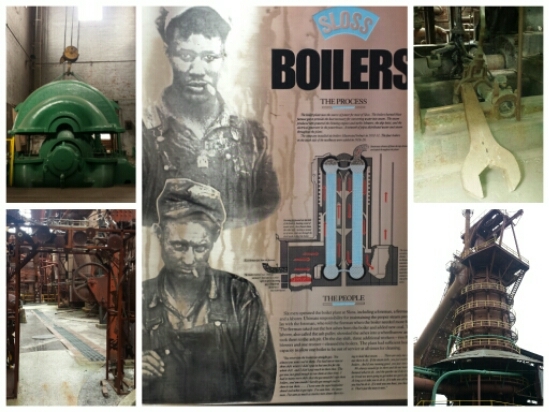 We did a self guided tour through the spray pond, stock trestle, boilers, hot blast stoves, and pyrometer house. For lunch we went to Saw’s Soul Kitchen on 41st Street South. From outside appearances I was not sure if I was at the right business. I couldn’t tell if it was a barbershop, car lot or flat out shack. As soon as you open the door there is a line to the register. The place is tiny. There are 6 tables which seat 4. Saw’s is not the place for those who need to specify how many ice cubes go into their drinks or picky about sharing elbow room with a complete stranger. If you want some food made to order with homemade sauces, then this is the spot. 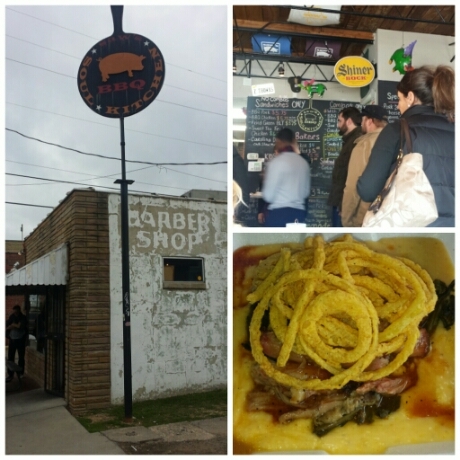 I tried one of their most popular dishes called “pork, grits and greens.” I was served a steaming helping of cheese grits, topped with turnip greens, bbq pork, and crispy onion rings. Once again, Birmingham’s Southern cuisine did not disappoint. Nylia ordered a burger that she had to eat with a knife and fork. The line was non stop the entire hour we were there. 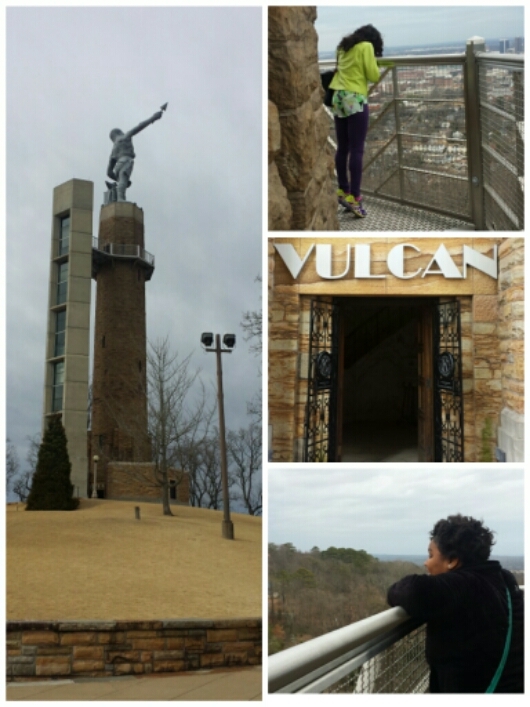 Our next stop was the Vulcan Tower and museum. 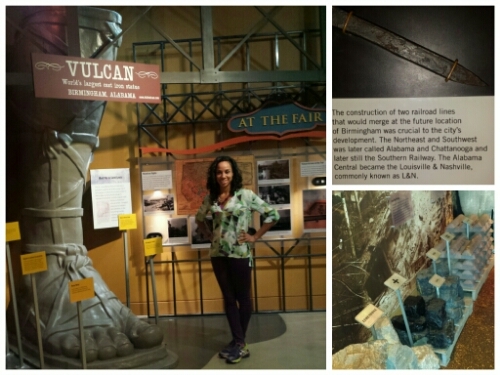 The Vulcan is the world’s largest cast iron statue. Finally, we reached the museum I have been wanting to visit since November. Sorry. No cameras allowed. I had a major sweet tooth after Saw’s and I wanted peach cobbler. A tour guide suggested Z’s restaurant. The man asked me if I wanted regular or large and of course I went for the large. There was nothing regular about this weekend. Desserts is Stressed spelled backwards. 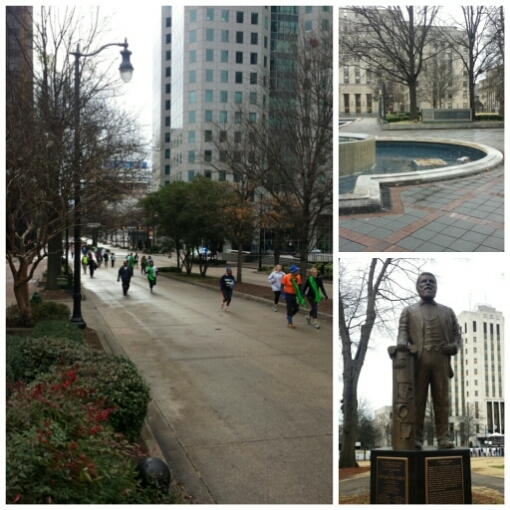 This entry was posted in Alabama, Birmingham, family, running and tagged civil rights Institute, heaviest corner on earth, peanut depot, sloss furnaces, superhero 5k, vulcan tower. Bookmark the permalink. 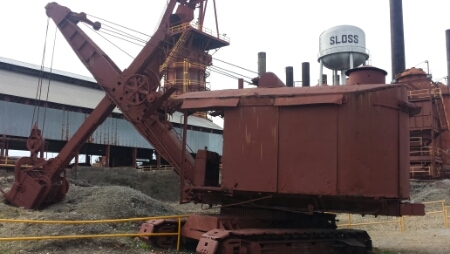 Sloss Furnace is one of the most haunted places in the world. I love going there and to Vulcan. Congrats on a great day! Wow! I did not know that. It makes sense because the workers labored through such rough conditions. Looks like y’all had a great Saturday! We did! I thought about ya…can’t wait to read your half recap. What a race!